ON A TRIP THROUGH Mississippi, I once saw an elderly man catching catfish using nothing but a coffee can as a “reel.” Strange as it may have looked, his can accomplished a reel’s simplest purpose: it held his line. 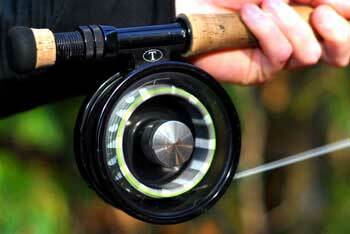 And for many fly fishermen, this is almost all a reel does. On the other hand, saltwater anglers sometimes need serious stopping power, and many big-game reels look like a brake array on a racecar. Between the coffee can and the engineering marvel is a whole range of technology that many anglers understand only vaguely. When manufacturers proclaim the virtues of their drag systems in advertisements and catalogs, they toss around terms such as “startup inertia,” and “cork to Rulon,” and “fully sealed,” often without fully explaining what these things are and why they are beneficial to anglers. If you stop to think about it, these terms raise a lot of questions about how reels are built and how they work. I set out to address these questions and more. What I learned may help you the next time you peer into that glass case at the fly shop — you’ll have a better grip on why objects with such a simple purpose vary so much in complexity … and price. “Fundamentally, a reel is like a bicycle wheel,” says Waterworks/Lamson’s Ryan Harrison. “You’ve got a hub or arbor in the middle, with a larger wheel around the outside. In bikes, that larger wheel holds the tire, but on a fly reel, it holds line.” And the similarities don’t end there: “If you want to slow down a bike, you’ve got to have a brake, right?” continues Harrison. “Well, a fly reel’s drag is the brake.” And, just as a bicycle brake would flip you over the handlebars if you applied it too quickly, so too will a fly reel’s drag snap your fish off if the drag engages too suddenly. Most anglers today are familiar with disc drag, because ever since the late 1990s it’s been the primary focus of reel design and advertising. Fundamentally, a disc drag slows the spool by friction, by applying pressure between two discs, usually one on the spool and one on the frame. That concept, simple as it sounds, is the source of almost all the myriad modern drag designs. Why so much variation? Because disc drags create a lot of problems, which make for a lot of solutions. The simplest, but by no means necessarily cheapest, disc drag is probably the “draw-bar drag.” A draw-bar drag is characterized by two brake surfaces — often resembling flat, cork (or synthetic) doughnuts — with one on the inside of the spool and the other mounted inside the frame. When the spool is attached to the frame, these two doughnuts meet, and through their center goes the arbor — the central cylinder where you first start winding the line. Having the brake pads go around the arbor maximizes the area available for a braking surface, meaning the drag can be stronger, and distributes the drag surface evenly around the reel, reducing wobble and making the drag smoother. When the draw-bar drag is deactivated — that is, when the drag knob is loosened completely — the spool can turn freely inside the frame in both directions, because the pads don’t touch. Crank the drag down, and suddenly the reel goes easily in only one direction. How does that happen? When you twist the drag-setting knob, you are turning a screw, which is shortening the “bar” or central spindle of the reel, thus “drawing” the spool tighter to the frame (hence the name, “draw-bar”). As when you are tightening any screw, the friction between the two surfaces increases depending on the pressure you apply, allowing you to adjust your drag. And where the frame and the spool touch, you’ll find your two braking surfaces making carefully controlled contact to smoothly slow your spool without any breakable gears and pawls. How come the reel can still turn in one direction when the spool is now sandwiched to the frame? A good question: the entire drag assembly is engineered to turn with the spool, but only in one direction. When the spool tries to go the other way, a clutch engages, locking the frame-side brake pad tight to the frame and forcing the spool side pad to turn against it, under friction, thus generating drag. On some reels, you can hear this clutch bouncing along as an incoming click. Another issue with high-performance drags is maintenance, which affects whether the drag can be sealed or open. Ryan Harrison explains: “Cork drag is great stuff: it’s smooth, compresses nicely, and has good friction. But it has a downside too; you have to maintain it.” Cork is actually a tree bark, and cork drags include some rubber bits to hold them together. Cork drags thus require regular applications of an appropriate lubricant to keep the organic material from drying out and cracking. Because it must be maintained, cork must be accessible, requiring an open design, with the drag surfaces visible inside the body. If sand or other material gets between the brake pads, you’ve got a problem. The standard click-and-pawl design is easy and inexpensive to manufacture, and it provides plenty of smooth resistance for most trout fishing. As Bauer Reels’ Jon Bauer explains, even water between the pads affects performance. “Any time water gets between spinning, flat discs, it is going to interfere. Most makers address this problem with grease to seal water out or slot designs to channel water away, but it can be a problem.” Many manufacturers have developed sealed drags, with the brake pads contained within a sealed cylinder, usually protected by rubber O-rings. These drags are maintenance-free and are not subject to hydroplaning or grit issues, but in order to be so, they have to sacrifice all materials that might require regular checkups, which means no cork. Sealed designs allow the entire drag array, including the spool’s brake pad, to stay on the frame; the system is complete only when the spool is reattached and locked back to its brake. Thus, if you pop the spool off, you won’t see the brake surface itself but rather the sealed back of the spool-side pad. Unlike with the cork drags, which open for maintenance, these systems hide their parts. Although the mechanical principle employed by these drags to tighten their brake surfaces is the same as on the draw-bar design, most manufacturers prefer to call them “drum” or “sealed disc” drags. The distinction lies in where the drags keep their brake pads. On a true “draw-bar,” the pads are large discs visible between the spool and the frame. 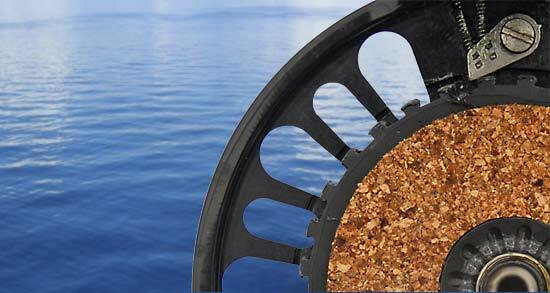 On the “drum drag,” these pads are smaller, contained within the arbor of the reel. As a result, many drum drags lack the sheer stopping power of the draw-bar, although they may make up for it in other ways. What exactly is startup inertia anyway? Any surface that drags, from fly reels to airplane wings, is measured by its “friction coefficient.” A fly reel that has a friction coefficient of zero would have no start up inertia, no resistance to movement, meaning that the second a fish began to take line, the reel would start rotating as smoothly as if it were at top speed. Unfortunately, we know from Physics 101 that objects at rest like to stay at rest, and reels are no different. In fact, no reel has zero startup inertia, although some designs boast very low (almost negligible) numbers. On the other hand, some materials, such as carbon fiber, have high coefficients of friction — good for stopping power, but bad for startup inertia. Designers are constantly balancing these two factors. Springs are very important in maintaining drag tension, and not just with synthetics. Cork drags have springs, too, because the cork itself isn’t thick enough to give a wide range of drag settings under its own compression. On many reels (both cork and synthetic), these springs take the form of Belleville washers, little cup-shaped discs that face each other and can be compressed with tension. Other designs use conventional springs under the drag knob. “When you’ve coaxed out your washer or spring tension and pressed them about flat,” explains Lepage, “cork gives you just a little more compressibility, so you get a wider range of drags, although not much.” Synthetics can’t do that, because they aren’t themselves compressible like cork. So which is better, cork or synthetic? After all, some of what are widely acknowledged to be fine reels, made by the likes of Tibor and Abel, get by without synthetics. The answer is: it depends on how much you’re willing to put into the reel. “To get the most out of cork,” says Albright’s Jim Murphy, “it’s all about lubrication. With ideal lubrication, I don’t think you can get better performance out of a drag than with cork.” To get ideal lubrication, however, you’ve got to put in the maintenance time. Because not every angler wants to become a shade-tree reel mechanic, the per-fish performance level maybe better for the average angler with synthetics such as Rulon or carbon, because they are zero-maintenance. So far, most of the discussion has been about the high-end stuff — reels designed to withstand the blitz of a running tuna or marlin at 50 miles and many thousands of rotations an hour. Even under those conditions, reel designers today admit their products are often overengineered. “Honestly, you could hook a car to one of these and you’d have to have like eight thousand yards of backing to kill it,” says Nautilus’s Kristen Mustad. What about your average trout or bass angler? Do they need these high-end drags? “Well, disc drags are really smooth,” says Orvis’s Lepage, “and anglers have almost unanimously voted for them at this point by buying them.” However, disc drags on trout reels aren’t usually as robust as those on saltwater, and almost no trout reels use cork. 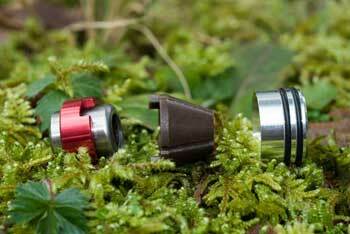 “Why would you want to stop a train with a cork drag while you’re trout fishing?” asks Ted Juracsik. How then are most trout drags designed? The draw-bar design is another feature you won’t see as much on trout reels. “Draw-bar drags are heavy,” says Albright’s Jim Murphy, “and while you can work around that, there are lighter — and cheaper — ways to design a trout reel.” Cost is a major factor here. One option is the smaller drum drag, where the brake pads are sealed under the arbor rather than between frame and spool. 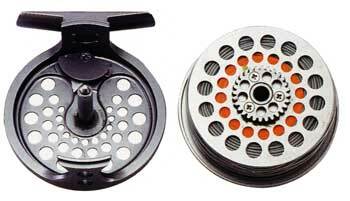 Another category of drags — the gear drag — is often employed in trout reels. These provide plenty of stopping power for trout, and since their parts can be stamped out en masse, the reel is less expensive. Gear-drag reels usually feature a smaller set of disc-brake pads, but instead of being around the arbor, you’ll find them out to the side, under the tension lever you adjust on the outside of the frame. You can spot such drag systems by that lever out of line with the arbor, or by the toothed gear-wheel on the inside of the spool. It is this gear-wheel, which fits into a matching gear attached to the drag lever, that slows the spool down. Thus, to clear up a common misconception, both gear-drag and draw-bar/drum-drag designs are “disc” drags. The draw-bar’s disc brake is visible as the large donut around the arbor or, on the drum design, as a noticeably oversized cylinder you cover with the spool, but the gear-drag’s disc brake is usually smaller, hidden behind the lever mechanism. Because of their smaller surface area, gear drags usually are not as strong as draw-bar or drum drags. Some manufacturers, such as Sage, are pushing the limits of traditional gear-drag design, turning the spool itself into a gear with the addition of machined teeth. Coupled with the use of carbon fiber discs, this design allows a light, open large-arbor reel to still have a strong drag. And, let’s be honest, there is still a place in today’s world for the traditional click-and-pawl reel. Hardy’s Lightweight series has been going strong since the middle of the last century. Its standardized parts, simple structure, and ease-of-repair have made it a perennial favorite with small-rod aficionados, especially since its lack of a heavy disc drag keeps the weight down. How do you tell these reels apart just by looking at them in the shop? It’s easier than you think. A draw-bar reel will have the drag knob dead-centered. If you pop the spool off, you’ll see either a cork or synthetic brake pad, or the back of the sealed drag. A gear-drag reel is easy to spot because of its off-center drag adjuster, usually a knob or lever near the bottom of the frame. Open one up to find gear teeth attached to the spool (or machined right in). Finally, the spring-and-pawl drag is conspicuous for its clicker (and lack of anything else) inside the frame. Whether you’re looking for the perfect fly reel, an heirloom to be treasured, or a beater to take out with those grand-kids, it’s in your best interest to know a little about the designs on the market. Perhaps more than with any other fly-fishing products, reels are subject to a cost-benefit analysis, and it pays to be honest with yourself. Do you need a saltwater “stop a train” drag for trout fishing? Probably not, but then again, some day you might. 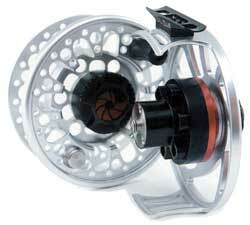 Is it really worth saving an extra 50 bucks to buy an el cheapo saltwater reel that might fail you at the worst time? Maybe — depends on whether you’re feeling lucky. 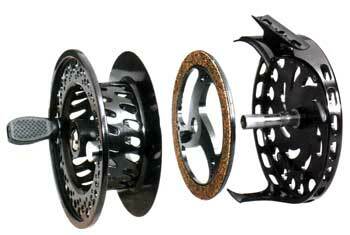 For myself, I buy the best reels I can afford for the tasks I plan to give them. And if I overkill a little, well, that’s part of fishing too; the surest sign of the ever-optimistic angler is usually right there at the base of the rod.